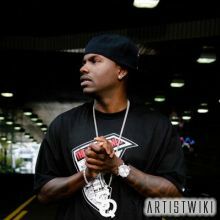 Stat Quo (born Stanley Benton July 24, 1979) is an Atlanta-based artist He has been generating mixtape buzz since 2002. He is also a part of Grown Man Music, a record label he founded with LT Moe. Stat Quo attended University of Florida before pursuing a rap career. His debut album Statlanta was expected to be released summer of 2007, but has been postponed a numerous amount of times and still hasn’t been released. Stat Quo is also featured on Young Buck’s Straight Outta Cashville and on the track “Spend Some Time” on Eminem’s Encore. Stat has appeared on tracks with artists such as Jermaine Dupri, The Alchemist and Chamillionaire. Stat Quo recently shot a video for his club banger entitled “Like Dat” which features Ludacris and Young Buck. The video was shot in Atlanta’s Zone 3 near the Thomasville Heights projects where Stat Quo once resided. The Atlanta bred rapper was featured on this summer’s Anger Management tour which also featured Eminem, 50 Cent, G-Unit, Obie Trice, D12, and others. The Aftermath/Shady debut album Statlanta is still in the works.